Have You Always Wanted Larger, Fuller Breasts? If you are like many women, you may feel that your breasts are disproportionately small and out of balance with the rest of your body. Perhaps your breasts are different sizes, creating a noticeable asymmetry, or you have lost fullness and shape following childbirth and breastfeeding. You cannot control your genetics, but you can change your appearance through surgery. 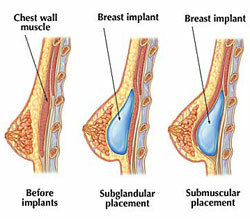 Breast augmentation is the use of a breast implant to enhance the size, contour, and shape of your breasts. In this surgical procedure, the implant is placed either beneath the breast tissue or beneath the pectoral muscles through an incision in the skin. Our goal is for you to return to most of your normal daily activities within 24 hours and use minimal pain medication. Our pre-operative medication regimen helps treat discomfort before it starts. Intraoperative technique minimizes trauma to the tissues to blunt the pain response. Post-operatively, a carefully designed program of warm showers and stretches helps get you back on your feet fast. We encourage you to go out to dinner the evening of your surgery.